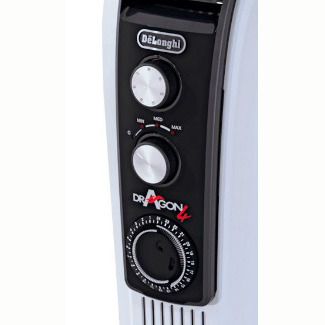 The Dragon 4 from De'Longhi is an efficient oil-filled radiator with 3 power settings and a maximum output of 2000W. 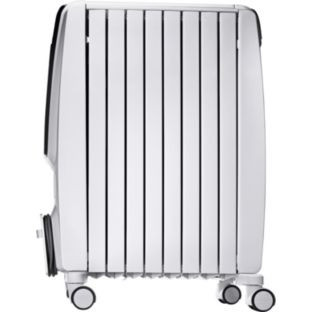 Resting on 4 pre-assembled castors, the Dragon 4 is easy to transport from room to room. 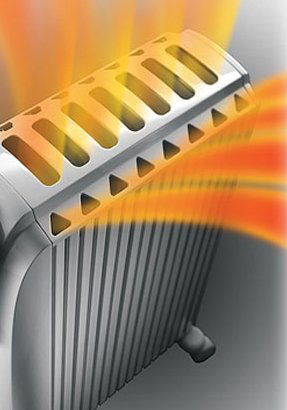 Its enlarged heat fin shape increases the chimney effect of the radiator for accelerated hot air delivery. The Dragon 4 also features a 24-hour analogue timer, thermostat, anti-frost function, carrying handle and cord storage. Dragon 4 provides steady, silent heat. Ideal for longer term use as the diathermic oil releases heat gradually. Fitted with pre-assembled Easy Wheels for transportation. De'Longhi technology, design and reliablity provides peace of mind and long lasting, effective comfort. enlarged heat fin shape, increases the chimney effect for accelerated hot air delivery, resulting in a more rapid heating of your room. Patented pre-assembled castors, for easy and practical movement around the home.